As the weather gets a little warmer, our lives seem to get even busier. 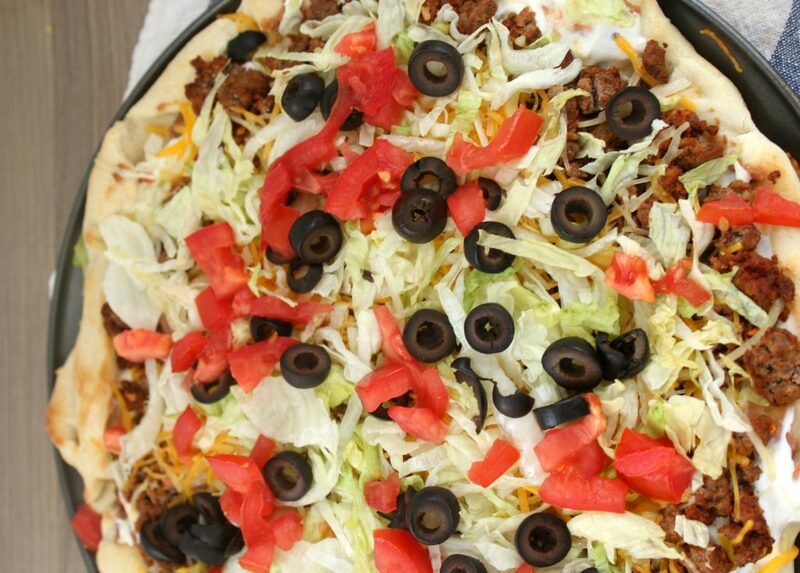 This Easy Taco Pizza can be thrown together in just a matter of minutes, and tastes amazing! Mix up your pizza night and enjoy an easy meal! Brown the ground beef over medium heat until completely cooked. Drain grease and mix in taco seasoning. Spread refried beans over pizza crust, and then spread sour cream over refried beans. Top with cooked ground beef, cheese, lettuce, olives, and tomatoes. Reduce the oven temp to 350 degrees and place pizza in oven for about 8 minutes or until cheese is melted and toppings are heated through. HELLO! THIS GOT MY ATTENTION. #1.SSSSOOOOO GOOD. Aren't we supposed to add wafter to the meat and sreasoning, too? No, just add the seasoning mix to the meat. If you add the water it will be too gooey for the pizza crust.